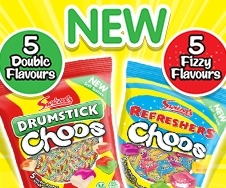 This web site is owned and operated by Swizzels Matlow Ltd.
We do not ask you to disclose any more information than is reasonably necessary to enable you to participate in an activity on our web site and to improve the web site. We do not generally disclose personal information we have collected from you through this web site to third parties. We may do so sometimes, in which case we will say so when the information is collected and you will be able to inform us that you do not want us to do this. This will not stop you enjoying the site, you can simply tell us that you are happy for us to have the information so you can take part in the activities we offer, but that you do not want us to pass that information on. When you enter competitions, we ask you for your name, email and residential address. If you win, we can let you know if you have won anything, send you your prize and let other people (such as other users of our website, the public and our own employees) know about our competitions and their winners. Where stated in individual competition T&C’s your data may be shared with agencies assisting with the competition. If you contact us through the “Contact Us” link on this site, we ask you for information such as your name, e-mail address, and other information, so we can respond to your questions and comments. You may choose to provide additional information as well. We may ask our website visitors and purchasers to complete surveys and opinion polls to provide feedback on activities, attitudes and interests. These surveys help us understand the needs of our visitors and purchasers. You may choose to register on our site. In the registration process, we sometimes request certain information (such as your contact information and age) so we can provide you with relevant information. When you purchase products from Swizzels Matlow we request your billing information so we can fulfill your request. We use your billing information only to send you the items you ordered.